I have this aversion to meatloaf. I don’t like it. If we’re being honest, I’ve never actually eaten meatloaf, but there has always been something about meatloaf that struck me as unnatural. Meat should not come in loaf form. Steaks? Yes. Filets? Please. Roast? Why not. Patties? Fine by me. Loaf? Hell no. I don’t know why I have this aversion to meat loaf; I just do. Maybe it’s my mother’s fault for never making it when I was growing up. That’s it…when all else fails, blame your parents. I also have this aversion to Valentine’s Day. I think it’s a dumb holiday. In fact, the only holiday I think is dumber than Valentine’s Day is Sweetest Day. To me Valentine’s Day just feels contrived. The romance is all well and good, but you’re doing it because someone, somewhere, decided you need to be romantic on February 14th. I would much rather get flowers on a random Tuesday or come home to find the cleaning fairy (read: the boy) showed up while I was at work and washed the sinkful of crusty dishes I left behind. Those things will always mean more to me than a dozen roses or a box of chocolates on Valentine’s Day. This might be my mother’s fault too; who knows? Anyway, back to the meatloaf. I don’t like it, but the boy does. From time to time he comments about wanting meatloaf, and I launch into my holier than thou, meatloaf is unnatural rant vowing to never make a meatloaf. The on Friday the stars aligned for the boy. 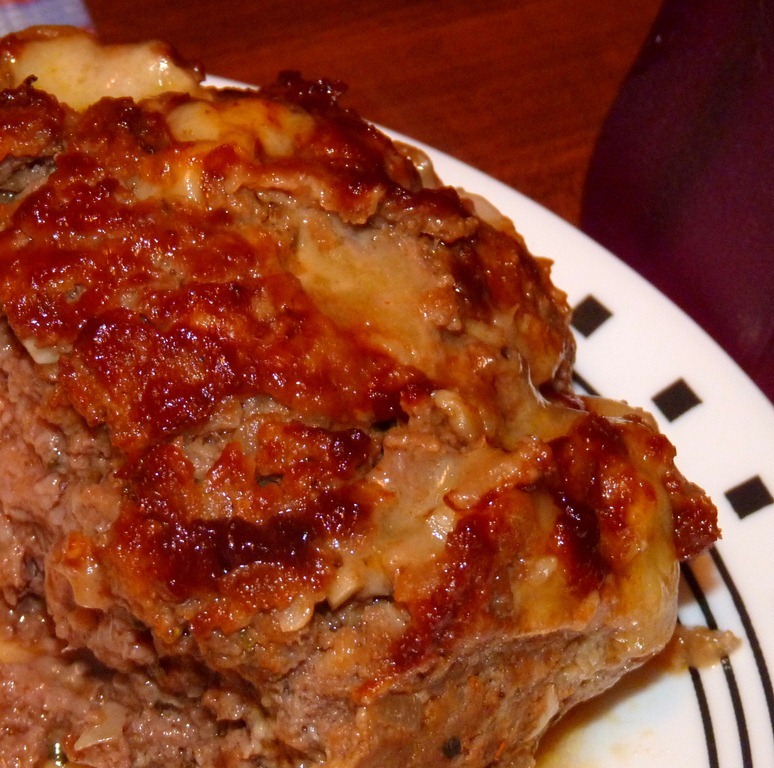 Cooking Light sent me a recipe for Cheesy Mini Meat Loafs, and with Valentine’s Day approaching, I decided to put aside aversion to meatloaf and my aversion Valentine’s Day and make some meatloaf for my love. The fact that I had a pound of ground beef in my freezer helped too. 2. Toast breadcrumb in skillet over medium-high heat stirring frequently so you don’t burn them. 3. Heat a small amount of olive oil in a skillet and sauté onions and garlic. 4. Combine garlic and onions and breadcrumbs with remaining ingredients except BBQ sauce. I mixed them together with my hands. 5. Shape mixture into a loaf on a piece of aluminum foil. Top with 1/4 BBQ sauce and wrap lightly. 6. Bake for 45 minutes or until done. I have to say this meatloaf was pretty good. I ranked in the Top 3 for Nik’s Meat Loaf Hall of Fame. I’m okay with that since I was beat out by his mom’s meatloaf. I’m still not a fan of the concept of meatloaf. It’s just weird to mean. I realize it’s little more than a giant hamburger, but I’m just not sure. Everyone’s got their quirks right? I do expect the boy will probably con me in to making this again though…maybe for his birthday. This entry was posted in Girl Can Cook and tagged beef, comfort food, dinner, meat, recipes by Stina. Bookmark the permalink. Mine didn’t come out crispy either. It was basically a glorified burger…or something. I think the cheese really makes this recipe honestly. Also, I used Annie’s Organic Sweet and Spicy BBQ sauce. I have to agree, I’ve never understood meatloaf or Valentines’ Day. I still don’t get meatloaf. It’s just weird!